Garlic aids hair growth in a variety of ways. Though often used to season foods like an herb, garlic is actually a vegetable. 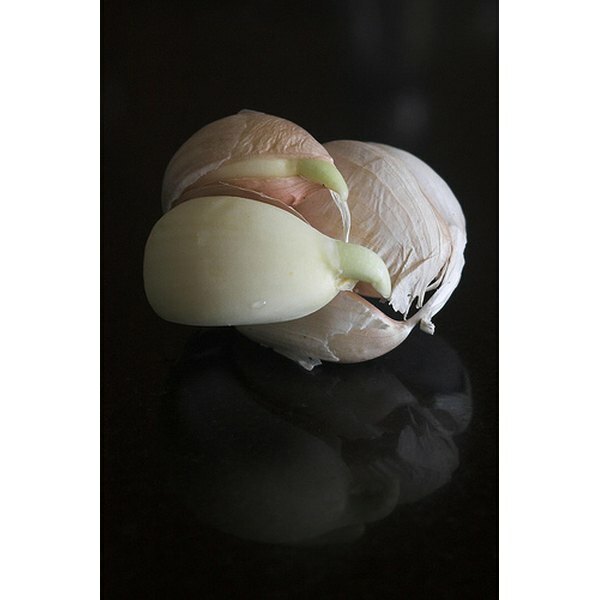 It is part of the allium class of bulb-shaped plants, which also includes onions, leeks and scallions. Garlic has an extremely high sulfur content, which is beneficial to hair. Garlic also has many other nutrients important to hair and general health, according to the National Cancer Institute. Garlic may also be a good topical remedy to improve hair growth. Garlic can help fight hair loss, found a study published in the January 2007 edition of the "Indian Journal of Dermatology, Venerology and Leprology." The study tested how much garlic gel boosted topical betamethasone valerate in the treatment of alopecia areata, a recurrent and non-scarring type of hair loss. The study concluded that adding garlic significantly improved the treatment of the condition. Perhaps that’s why topical garlic solutions are popular among folk remedies, some of which recommend slicing a garlic clove open and rubbing it on hairless areas. The remedy calls for an olive oil massage an hour later, and leaving the treatment on overnight. Garlic has many nutritional components beneficial to hair, including sulfur. Sulfur is a structural part of many proteins, including keratin, the protein hair is made of. Sulfur is also beneficial for skin, nails and nerves. It can be used therapeutically to fight psoriasis and eczema, both conditions that can detract from hair health. The selenium in garlic works with vitamin E to improve hair health. Selenium boosts the body’s ability to utilize vitamin E to destroy free radicals that damage cell membranes. People who don’t have the proper ability to utilize vitamin E, or who lack vitamin E, often lose hair or have hair that is dry or dull. Selenium also improves skin elasticity. Garlic is a good source of vitamins C, B-6 and B-1 (thiamine), which are important to hair health. Vitamin C protects hair from breaking and also helps boost collagen. Lack of vitamin B-6 can lead to hair loss, and thiamine aids in scalp circulation as well as carbohydrate metabolism. Minerals in garlic also aid hair health. Calcium provides a structural component in hair. Copper helps hair grow and also prevents defective hair growth. Iron aids in hair growth as well as hair maintenance. Manganese helps the body utilize other nutrients that are important to hair health. Linda Tarr Kent is a reporter and editor with more than 20 years experience at Gannett Company Inc., The McClatchy Company, Sound Publishing Inc., Mach Publishing, MomFit The Movement and other companies. Her area of expertise is health and fitness. She is a Bosu fitness and stand-up paddle surfing instructor. Kent holds a bachelor's degree in journalism from Washington State University. How Many Calories Are in Garlic Chicken Chinese Food?